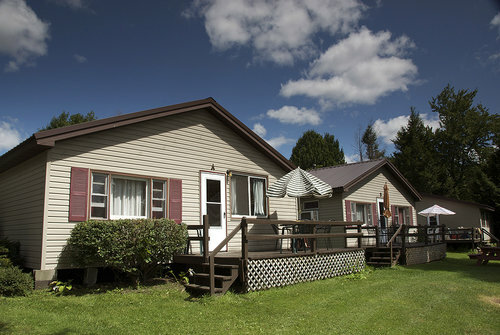 Anglers’ Bay offers six cottages located steps from and with views of Oneida Lake. From our location on the north shore, you can immediately access Oneida Lake and its rich fishing and boating resources. Located less than an hour from both Lake Ontario and the Salmon River, Anglers’ Bay represents an excellent option for those wishing to explore three world class fishing destinations on the same trip. Please remember that you do not have a cottage booking until your deposit has been paid. Also we do not provide linens, towels, blankets, or pillows–you must bring those yourself. Check-in is at 3pm on the day of your rental–please do not arrive prior to that time without making arrangements with us before, you will be turned away. Our staff needs time to turn over the cottages. Arriving before others have checked-out creates enormous logistical issues with our facility. Earlier check-in times can be arranged for a small fee. Prior to booking, take the time to review our cancellation policy as outlined below. This two bedroom, one bathroom cottage features a full kitchen with our largest large living/dining room. This unit is equipped with a TV, WiFi access, A/C, full size refrigerator, stove with oven, toaster, coffee maker, and a microwave. The first bedroom offers a single full bed and the second bedroom offers one set of twin sized bunk beds a single twin bed and a cot. The deck on this unit provides a nice view of the lake, access to a fire pit, and a charcoal grill. From 6/4 to 7/23 this cottage is only bookable for FULL WEEKS. This two bedroom, one bathroom cottage features an eat in kitchen with a living room. This unit offers a TV, WiFi access, A/C, full size refrigerator, stove with oven, toaster, coffee maker, and a microwave. The first bedroom offers a single full bed and the second bedroom offers two sets of twin sized bunk beds. The deck on this unit provides a nice view of the lake, access to a fire pit, and a charcoal grill. A two bedroom, one bathroom cottage features an eat in kitchen with a large living room. This cottage offers a TV, WiFi access, A/C, full size refrigerator, full size stove with oven, toaster, coffee maker, and a microwave. The first bedroom offers a single full bed and the second bedroom offers two sets of twin sized bunk beds. The large deck on this unit provides the best view of the lake in comparison with Cottages A and B, access to a fire pit, and a charcoal grill. This unit is our best value. One bedroom with four twin bunks. The eat in kitchen offers a full refrigerator, stove with oven, coffee maker, toaster, and a microwave. This unit has a huge deck overlooking the water. We recommend this unit for groups that spent the majority of their time out on the water as it does not offer much in the way of common space. The bedroom features a full bed and the television is also located in the bedroom. The eat in kitchen offers a full refrigerator, stove with oven, coffee maker, toaster, and a microwave. The deck is the perfect spot for an intimate gathering with the fire pit sitting just below. A charcoal grill is also available outside. This unit is close to the water and represents a great option for those who are no longer as mobile as they once were. Cottage F is a great option for those looking for our most peaceful setting. This unit is just twenty feet from the water and features a deck and easy access to the island in front of Anglers’ Bay. Off the deck you find nice flower gardens, a picnic table, fire pit, and a charcoal grill. This unit is located away from the rest of our cottages and affords the guest a touch more privacy. The interior of the unit offers a full sized stove with oven, full sized refrigerator, A/C, WiFi, microwave, coffee maker, and toaster. The first bedroom features a full bed with a twin bunk above, and the second bedroom offers a twin sized bunk bed. The living room in this unit is smaller than the living rooms in Cottages A, B, and C, but the sounds of the water easily make up for its lack of size. This unit is perfect for smaller groups and couples. This unit is very close to the water and represents our best option for those who are no longer as mobile as they once were. We do not offer linens in our cottages, you must bring your own sheets, pillows, towels, and blankets–this amounts to a major savings to our customers of about 25% due to ludicrous policies by our local government. We provide sponges, dish soap, basic utensils needed for cooking, and toilet paper. We do not allow pets in our units due to complaints (allergies) from previous guests. As much as we love pets, we have come to the conclusion that we must operate in this fashion. We also do not allow smoking in the units for the same reason and we will enforce a cleaning charge if you do smoke in the units. Our target market is groups who come to fish, boat, or otherwise enjoy Oneida Lake’s offerings. These are not hotel style units, we do not offer a spa or other resort style amenities. We are ten minutes outside of Sylvan Beach and located in a somewhat rural environment, there are no stores or shopping areas within walking distance of our location. There are convenience stores and restaurants located within a five minute drive and a bunch of options within fifteen minutes. If you have moral objections to hunting and fishing and prefer not to be around outdoors men, we are not a good option for you but we are willing to make alternative suggestions. We have a fish cleaning station on site and it gets plenty of action. With respect to cottage capacities, we list the number of beds and let you determine what you are comfortable with. We do not charge for additional guests and if your group is comfortable with eight people and five beds then so are we. We get the question, how many can such and such a cottage fit and the answer is subjective. For instance, a couple who shares the same bed and has four kids would find Cottages A, B, and C perfect–where six guys who all want a bed would not. Give us a call if you have questions and we will help you figure it out. We do not have any cots or additional bedding options so please plan accordingly if your group is larger. Typically larger groups book a combination of Cottages A, B, and C to remain close and utilize Cottage B for cooking due to its middle location and also because its kitchen is located in the entry of the cottage. Dock slip charges are extra and we offer rates by the for shorter stays as well the week. If you do not book a slip in advance, we cannot guarantee slip availability. You must register your boat in the office when you arrive. We will assign you a dock space. If you have a larger boat or space preference, please let us know in advance so that we can accommodate your needs. Please be respectful of others by not asking for a deep water spot if you have a very small boat or by taking someone’s spot. This bears repeating as it happens once a year… if you do not book a slip in advance, we cannot guarantee slip availability. It is impossible for us to know how many boats your group is bringing, might be bringing, brought last year, is thinking about bringing, etc. Pretending we should is plain silly. We have a finite amount of dock space and do book those spots to people not staying at our cottages. This helps us keep our prices low by utilizing our resources fully. Please note that our larger cottages are booked for full weeks running Sunday (check-in 3pm) to Sunday (check-out 10am) during the peak season, which runs from 6/4 to 7/23. We are now offering four night and three night stays during non-peak times and also offer these stays in our smaller cottages. An additional note on check-in times, please do not arrive early without making prior arrangements with us–if we can do it we will. Also understand that while we attempt to accommodate our guests needs, it is not fair to our previous guests to push them out the door–the same as you don’t want to be pushed out the door when you leave. Please also understand that preference for those checking in early is given to those coming from longer distances away and is dependent on the group’s schedule that has reserved before you. If we cannot accommodate an early check-in for you, it is not because we hate you, don’t value your business, or because their is a global conspiracy against you. It’s simply that we could not due to the circumstances. Showing up at 8am and hanging out in front of your cottage when someone else is trying to finish up their vacation is flat out rude and it will not be tolerated. Habitual violators of this policy have been asked not to come back as I have received complaints (rightly so) from guests. Keep in mind we have many units to service along with assisting customers on check-in/out days and we need the time to properly care for our cottages. If you need anything during your stay, our office is open from 9am to 5pm each day and we are often around more than that. You are responsible for the entire cost of your stay. No refunds are issued for no-shows or early departures. We do not hold cottages. If you have not made a payment and completed a signed rental agreement (sent to you on booking), you have not made a booking. Cancellations must be by EMAIL (booking@fishoneida.com) only! We do not accept telephone cancellations. Reducing the length of stay, the number of cottages, or the value of the original reservation constitutes as a cancellation and is subject to our policy. Cancellations due to inclement weather, natural or man-made disasters are non-refundable if we do not receive notice of cancellation by the required cancellation dates outlined. To receive a full refund, less a $50 processing fee, you agree to give us notice of cancellation, by EMAIL, and by the Cancellation Deadlines outlined below. If you do not receive a cancellation confirmation email within twenty-four (24) hours, please call to make sure we received your request. No cancellations are allowed if you are booking within 30 days of your stay. 30 day cancellation notice required for stays totaling four (4) or less nights. 60 day cancellation notice required for weekly stays. To book a cottage, one-half (1/2) of the total amount is due at booking, with the balance due thirty days prior to arrival. If you are booking a cottage and/or boat and your arrival date is within thirty (30) days, the total amount is due at booking and you are NOT eligible for a refund due to cancellation. A booking is made upon payment and your completion of the rental agreement, we can not stress enough that merely having a conversation with us regarding a booking does not constitute a booking. You can book your cottage for the same week next year. Please take note of these important policies. 1) You cannot book more than a year in advance, i.e. the people with a particular week have the first right of refusal for that spot next year. If you want a later date, you must wait for them to decide. 2) You do not need to place a deposit to hold your dates for the following year. After January 1 you will receive an invoice confirming your dates and arrangements and half will be due by the end of the month. 3) If we have not received your deposit by February 1, we will release those dates to our online booking system and you are no longer guaranteed your spot. We have some habitual offenders of this policy who were booked over. If you have an issue, call us. 4) As always, no deposit=no booking. Someone does this nearly every year so we repeat it, if you have not put a deposit down, you DO NOT have a booking.